EarthDesk 5 is the latest release of our award-winning dynamic desktop application. 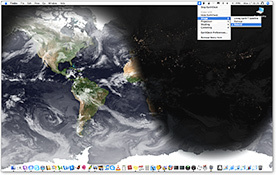 EarthDesk replaces your Macintosh desktop or Windows wallpaper with a stunning, real-time dynamic image of our planet continuously updating in the background while you work. With up to 4 maps, 11 projections and 10,000 cities, EarthDesk is truly a map-lover's dream. Put it on your desktop today. Put the world on your desktop.Multiple monitors and projections. ...... Now imagine having that view on your desktop. Welcome to EarthDesk. EarthDesk features real-time clouds (updated at 3-hour intervals) with transparency and moonlight reflection, accurate sun, moon and city lighting, and high quality twilight shading. Among EarthDesk's highlights are eleven map projections, a database of 10,000 cities for centering the map, as well as enhanced satellite, natural satellite and political maps. EarthDesk automatically updates when waking from sleep and supports multiple displays. EarthDesk's wide variety of map projections gives you complete control over the maps on your desktop. Qweas is providing links to EarthDesk 5.8.4 as a courtesy, and makes no representations regarding EarthDesk or any other applications or any information related thereto. Any questions, complaints or claims regarding this application EarthDesk 5.8.4 must be directed to the appropriate software vendor. You may click the publisher link of EarthDesk on the top of this page to get more details about the vendor.